If you are looking for the best personal air purifier that produces negative ions, rather than ozone, this page has a detailed review of travel air ionizers and portable air purifiers, plus why they are recommended. First, we will look at wearable air cleaners, like the popular AirTamer, that can travel with you anywhere you go, no matter how polluted the air is. 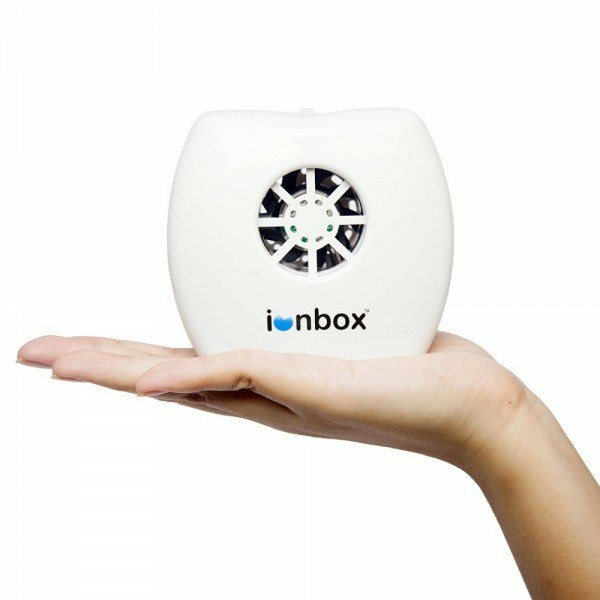 Followed by a review of the best portable air cleaners, such as the bestselling IonBox, that are small enough to carry with you to work or on holiday and can be powered by USB cable. What are Personal Air Purifiers? Why Would You Want an Air Purifier Necklace? What are Portable Air Purifiers? Why Would You Want a Portable Ionizer? These devices are miniature air ionizers, usually worn around the neck, that remove airborne pollutants from your breathing space. Good personal air purifiers use negative ions to clean the air of allergens and contaminants before you breathe them into your lungs. However, some poorly designed products on the market try to achieve the same result with ozone. You’ll discover how to tell the difference and why these are best avoided ahead. If you live in a city like most people, then the air you breathe each day can be very polluted. Ground level ozone, carbon monoxide, sulfur dioxide and fine particle pollution are behind many respiratory problems like asthma. Older people and those with existing breathing conditions are at extra risk, but all of us can experience fatigue, lower immunity against disease and diminished health and energy when we breathe polluted air on a regular basis. Within your home you can easily remedy this dangerous problem with a true ionic air purifier like one of these. What about when you are walking on the street though, or have to spend a lot of time in poor air environments like offices, airplanes, public transport, or any enclosed space with many people? Travel air purifiers, like this great little ionizer I use, provide a simple way to clean the air you breathe immediately under your nose, regardless of how bad it may be around you. As well as combating pollution, the portable ionizers recommended ahead will flood your breathing space with energizing negative ions and also help prevent you breathing pollen, VOCs, dust mite allergens, and airborne viruses, bacteria and mold spores into your lungs. There are two common methods of air cleaning used by small and compact air purifiers — negative ion generation and ozone production. I would highly recommend you avoid any air purifier that relies on ozone rather negative ions, especially one you will be wearing close to your nose. While ozone does destroy airborne bacteria and viruses, it can also be an irritant at high levels. This is an unnecessary risk when corona discharge ionization will both clean the air and provide numerous health benefits, without the side effects of excessive ozone. The more negative ions your personal ionizer produces the better it’s ability to remove pollution and airborne contaminants from the air you breathe. Negative ions are usually measured in ions per cubic centimeter per second and you would be looking for an output of at least 1 million cm3/sec to be effective. Reviews of popular personal air purifiers on Amazon are often the best way to get an idea of the ease of use, build quality and likely effectiveness of a personal ionizer you are considering buying. If there are dozens of reviewers giving a predominantly positive rating it’s obviously much more likely to be a reliable and effective wearable ionizer than a product that has very few reviews. Problems can happen with any electronic product, but Amazon has a dedicated returns center. Most sellers offer returns for items within 30 days of receipt of shipment, though it’s best to check this on the individual product page. Keeping in mind what to avoid and what to look for when choosing the best travel air purifier, here are my top 2 picks for wearable air ionizers. I base these choices on my detailed research, contacting each company directly and owning the first recommendation myself. This new AirTamer A310 I have is a stylish and surprisingly powerful little air ionizer that generates more than 2 million beneficial negative ions per cubic centimeter every second. At 1.8 by 3.5 inches, it’s very small for such a strong negative ion generator and quite slim at only 0.8 thick. You can place it close beside you on your work desk to purify the dusty and draining positive ion heavy air at most offices. Better still, wear it around your neck whenever you are in a polluted environment, like a smog-filled city street, near smokers, traveling on an airplane, or on public transport to protect against airborne viruses and combat body odor smells and cloying fragrances. The AirTamer A310 is FCC certified for airline safety, so it is fine to fly with. Having this travel air cleaner working while flying can help protect you from cold and flu viruses, which are often concentrated in confined spaces like plane cabins. It also does not to release any harmful EMF emissions and has virtually undetectable ozone levels. At only 4 parts per billion, the AirTamer air purifier is more than 10 times lower than the EPA’s recommended 50 parts per billion limit on ozone from electronic equipment. It comes with an adjustable conductive lanyard that actually increases ionic air purification around the wearer. There’s a simple breakaway feature if you need to take it on and off quickly too. I also particularly like the fact that you can charge it via USB like a smartphone, rather than relying on batteries, as was the case with the older AirTamer A302 model. A single USB charge will power this brilliant little portable ionizer for over 150 hours of continuous use, so there is no reason not to keep it on and cleaning your personal airspace all day. How Does the AirTamer A310 Work? The AirTamer will create an approximately 3-foot wide radius of safer air around you whenever you switch it on. It works by generating over 2 million healthy negative ions per cm3 every second from the tiny black brush at the top of the ionizer. These ions propel upward and away from the AirTamer so it’s important to have it close to you and facing up or towards you if it’s not around your neck. Due to their electrostatic charge, negative ions will naturally attach themselves to airborne pollutants like pollen, pet dander, dust mite allergens, cigarette smoke, volatile organic compounds, carbon monoxide, fine particles and viruses, bacteria and mold spores attached to water vapor. Once this happens, the airborne contaminants become attracted to positively charged surfaces in the vicinity like tables, windows and walls. No longer floating in the air, you won’t be able to breathe them into your lungs where they do their damage. The small size, stylish design, long lasting charge and high negative ion output make the AirTamer A310 the best personal air purifier currently available. It’s relatively new but that means it has the best technology packed into a very compact wearable ionizer. You can read the many positive reviews and check the price on Amazon here. It’s a great investment in your long-term health and many people comment on how quickly their energy levels increase once they start using the AirTamer to stop breathing in polluted air. Wein makes a great high negative ion output air ionizer for your home or workplace, so I was interested to research what they had come up with in their wearable personal air cleaner — the Mini-Mate Air Supply. This small air purifier necklace produces more than 1.5 million negative ions a second per cubic centimeter and weighs only 43 grams. It’s dimensions are 1.5 by 2.5 inches making it smaller than the AirTamer, though just slightly thicker at .85 inches. Once again, ozone is virtually undetectable with this wearable ionizer at less than 3 parts per billion versus the 50 parts per billion safe limit from the EPA. Also, like the previous personal air cleaner reviewed, the Mini-Mate comes with a breakaway neck strap and it is recommended to wear around your neck for maximum air purification and allergen reduction. The biggest difference between the Air Supply Mini-Mate and the AirTamer is that Wein’s miniature ionizer is powered by a battery and cannot be charged by USB. There is a battery included when you first buy this little air purifier and it will last for approximately 50 hours of use with one battery. If you want to use the daily it would be best to buy rechargeable lithium batteries of the same size. These are fine to use for air travel according to the FAA. The reviews for the Wein Mini-Mate AS150MM aren’t as positive overall as the AirTamer A310. Though I did contact the manufacturer Wein and they confirmed by email that the Mini-Mate comes with a 1-year warranty, even if you buy it on Amazon. The biggest selling point of this air cleaning necklace though is how much less it costs than the previous model. Check the current price on Amazon here but I’d be surprised if it isn’t much less than you would have expected. If you are on a tight budget, or only intend to use it occasionally, then the Mini-Mate Air Supply is very good value for such an effective little travel ionizer. However, overall this newer and more powerful AirTamer A310 still looks like the best of the personal air purifiers currently available in 2019. These are small and compact air ionizers, usually positioned beside you on a desk or table, that remove airborne pollutants and allergens from the surrounding air. Portable air purifiers are a bit larger than personal air cleaners and are not wearable. They should be easy to move though and preferably powered by USB so you can take them with you to work or when traveling. Once again, it’s highly recommended to choose a desktop ionizer than uses negative ions to clean the air of allergens and airborne pollutants, rather than ozone, which can irritate your lungs at higher concentrations. 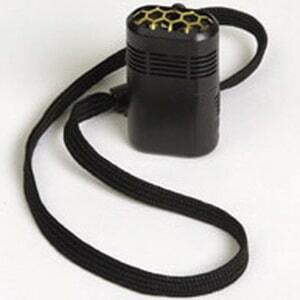 You generally wouldn’t use a small air purifier like this outdoors and you can’t keep them on you like the AirTamer and other wearable ionizers. They are, however, brilliant devices for cleaning the air in your workspace or whenever you spend the most time during the day. Even though you may think the air in your home is clean, most household air is full of allergens from dust mites, volatile organic compounds and toxic mold spores. Pollen can be a real problem at certain times of the year, as will cold and flu viruses, and if you have a pet then floating dander can often cause lung irritation if inhaled. The air at most offices is thick with harmful positive ions that can drain your energy, but ionizers produce beneficial negative ions that counteract this effect. And of course, if you work alongside other people in an office, then airborne viruses, bacteria, body odor or even just bad perfume are all problems that a small air purifier can help to deal with. The portable air cleaners recommended ahead are compact and light enough to take with you to work or pack in your suitcase when traveling, yet still provide high powered air cleaning due to their exceptional negative ion output and other technologies. Once again, it’s highly recommended to avoid so called ‘ionic air purifiers’ that are in fact primarily ozone generators. Your air cleaner should use healthy negative ions to remove allergens from your breathing space, not unsafe levels of ozone. If the portable ionizer you are looking at doesn’t list a tested ozone level that is well below the 50 parts per billion limit recommended by the EPA, or specifically say it produces no ozone like this bestseller, then consider it suspect and worth avoiding. Portable air cleaners aren’t usually quite as close to you as wearable ionizers so you would want a higher negative ion output to make up for it. Look for at least 5 million negative ions per second to be effective. To make it easy to use, it’s good to have a tabletop air purifier that is small, lightweight and easy to take to work in a backpack or on holidays in a suitcase. I also personally like having USB power as an option so I can use a device with my laptop anywhere. Both of the air purifiers reviewed ahead can be powered by USB and use minimal power to run. While a true HEPA filter would be beneficial for air cleaning, some portable air ionizer designs make the mistake of actually including features that diminish the effectiveness of ionization. Aroma dispensers are a prime example of this. Any device that emits aroma at the same time as negative ions is working against itself and should be avoided. The anions will attach to the airborne aroma particles like any other pollutant. This is a pointless feature and I suspect the only logical reason to include it is to mask the smell of ozone at higher concentrations. I’ve even seen so-called ‘air purifiers’ that are said to double as humidifiers. Without a doubt avoid ionizer products like these. The two technologies do not work well together and any beneficial negative ions would attach to humidified air being produced, rendering them much less effective. Portable air filtration systems that use both negative ions and a true HEPA filter would be very effective at cleaning the air you breathe. HEPA filters are excellent at removing larger allergens like pollen, mold spores, pet dander and dust, allowing negative ions to work more effectively on smaller forms of pollution and contaminants. Be aware though that you will have to occasionally replace the filter in HEPA based air cleaners for them to remain effective. This is an extra cost to factor in but the improved air purification potential is usually worth it. If you’d like to see the best larger air purifiers available with HEPA filters then check this detailed article. For small and portable ionizers, the top 2 I’ve found on the market are next. The stylish IonBox is small enough to fit in the palm of your hand, yet it produces an amazing 20 million negative ions per second, making it by far the most powerful of the compact ionizers reviewed here. At the same time as preventing you breathing airborne viruses, bacteria, molds, VOCs, cigarette smoke, and allergens like pollen, dust and pet dander, the Ionbox produces zero ozone due to its unique design. This compact and lightweight air cleaner can be powered directly from a USB port, which makes it great for taking to work or on trips away. It can also plug into a standard power socket where it uses a minimal 1.5 watts and is very energy efficient. There’s much more detail, pictures, specifications and customer feedback on the bestselling IonBox here. It is also surprisingly affordable and hard to go past if you are looking for a high negative ion output ionizer and air purifier that is compact and portable. In an unusual design, this popular new portable air filter combines the cleaning power of 5 million negative ions per second with a true HEPA filter. Such a combination is usually only seen in much larger ionizing air purifiers, but this small ionizer and desktop air filter is only 4.9 by 7.6 inches and weighs just 1.2 pounds. It is also powered by either a standard AC adapter or a USB cable so you can plug into your laptop, which makes it great for portability and travel. Another factor to consider with this particular tabletop air purifier is the need to replace the HEPA filter approximately every 6 months if using it regularly. These replacement filters can be found here and it would make sense to order an extra one at the same time if you are buying the WSTA air cleaner. The manufacturers say this compact HEPA filter and ionizer combination and will clean the air in 10 ft radius, though I would expect the best result at a much closer range. It also comes in both black and wood grain finish for a different look. Operation is said to be whisper quiet, and reviewers seem to agree, so it’s best to place this little air purifier next to you on your desk or on a table near where you are sitting. With its USB power source you can even use it as a car ionizer in newer cars and position it in the cup holder. The WSTA desktop air purifier with HEPA filter is very good value for a HEPA/ionizer combination and reviews are generally positive. Have a look and see for yourself if this is the portable air cleaner you’ve been looking for. I hope this review of the best personal air purifiers and portable ionizers has helped you find a good product to stop breathing damaging pollutants into your lungs. Please share it with anyone you think this information could help as well. The quality of the air you breathe can have a dramatic impact on the quality of your overall health and through this affect how good you feel in your day to day life. Small air purifiers that generate negative ions, like the ones recommended, provide a simple way to remove pollution, viruses, odors and allergens from your breathing space. If you would like to improve the air for your entire family in your home, or combat pollutants in your office, then consider the best larger ionic air purifiers listed here for even more air cleaning power.